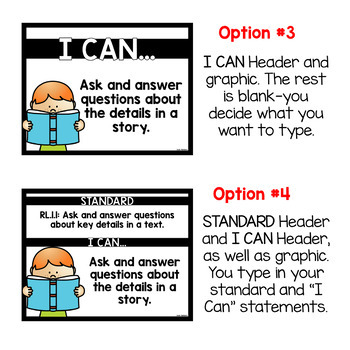 Tired of handwriting your "I Can" statements/objectives each day or week? 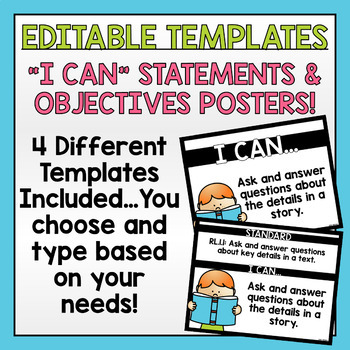 These editable posters were created to make changing your objectives display that much easier! NOTE-THESE POSTERS DO NOT ALREADY CONTAIN I CAN STATEMENTS, OBJECTIVES, OR STANDARDS. This is simply an editable template for you to type what you need based on the needs of your classroom. There are 9 different graphics included throughout the product (see preview-images for math, science, social studies, writing, reading, art, music, PE, and technology are included). There are 4 DIFFERENT TEMPLATES for each of these different graphics. Please see the preview for an example of each template...but to sum it up, there is a blank one, an I CAN header, an OBJECTIVE header, and one with both a STANDARD and I CAN header. The headers and images are NOT EDITABLE. 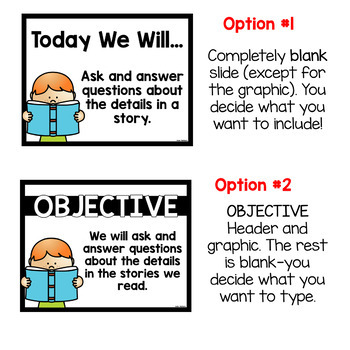 There are also headers included for each subject area that can be displayed above each objective. There are pre-typed ones for each clip art image, but there are also blank ones in case the wording you would normally use is not included (see preview). If you have any questions about this product, please ask prior to purchasing! You must have PowerPoint to edit this file. Also, the font used throughout can be downloaded for free for personal use by clicking the link below! However, you are free to use any fonts you would like as you edit. If you do decide to purchase this product, please leave feedback! Not only is it valuable to me, but you will also earn TpT credits to apply toward your future purchases! Teach 1st grade? Click here to check out my no prep sub plans!